A red brick building with a slate roof and a flat roof extension over the kitchen and school room. It has a car park. Service: 10.30am including Sunday School. On Tuesdays there are 2 computers available for use free of charge including the internet and printing. 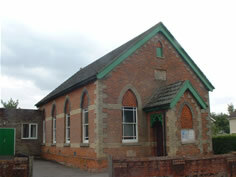 The building is also used by various community groups during the week including being a Community Access Point sponsored by the Local Authority. This Church is in the Ely and Newmarket Circuit. A list of all the churches in The Ely and Newmarket Circuit can be found lower down this page.